The Uniform Real Property Transfer on Death Act was integrated into Oregon's laws at ORS 93.948-93.979 (2011). When applied correctly, owners of real property in Oregon can, while still alive, use transfer on death deeds to direct and modify what happens to their land when they die. The statutes contain forms and specific instructions for the landowners, but provide very little information for the surviving beneficiaries. According to 93.969(1)(a)(A), when the transferor/owner dies, his/her interest in the property transfers "to the designated beneficiary in accordance with the deed if the designated beneficiary survives the transferor." There is, however, scant additional guidance for the beneficiary who wishes to officially initiate the transfer. While there are no specific statutory steps, one way for the surviving beneficiary to formalize the conveyance is by executing and recording an affidavit of survivorship. This document, when accompanied by a certified copy of the deceased owner's death certificate, provides official notice of the change in ownership. Land ownership comes with duties and obligations. Sometimes the named beneficiaries are unable or unwilling to meet those responsibilities. In those cases, the beneficiary may opt out of the transfer by disclaiming all or part of his/her interest as provided in 105.623 ( 93.971). A "beneficiary takes the property subject to all conveyances, encumbrances . . . and other interests to which the property is subject at the transferor's death" ( 93.969(2)). In addition, land conveyed using a "transfer on death deed transfers property without covenant or warranty of title even if the deed contains a contrary provision" ( 93.969(4)). The beneficiary must also be aware that, for the first 18 months following the owner's death, there might be liability for creditor claims from the transferor's estate. See 93.973. Maintaining current ownership information is important for numerous reasons. For example, if the local property taxes are unpaid, the delinquency could lead to fines, penalties, and possibly even sale of the property to cover the lost revenue and collection expenses. Another motivating factor is the benefit of preserving a clear chain of title. The chain of title, or ownership history for a specific parcel of real estate, should show an unbroken sequence from one owner to the next, with no gaps in time, reversals, or other details out of sequence. 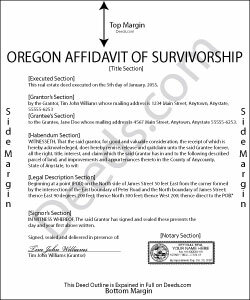 Recording the affidavit of survivorship keeps the series of owners intact, and the resulting continuity will allow a future purchaser to obtain title insurance more easily.